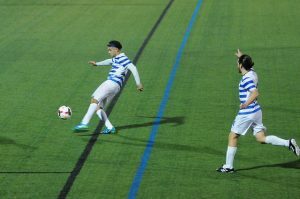 The MSMC Men’s and Women’s soccer teams have been facing tough opponents this past week but this was no issue as they were able to maintain their undefeated streak. The Men’s team faced Sarah Lawrence College, and the Women’s team faced College of Mount Saint Vincent on Oct. 2. The men’s team defeated Sarah Lawrence with a 2-0 score, giving the Knights a third straight victory. Matthew Wyant assisted Connor Lynch with a corner kick that Lynch headed in the net. Fred Stark gave a cross to Bobby Caronia that was too fast for the goalkeeper to stop and secured the win. The Knights took the majority of shots and kept possession for the duration of the game. The women’s team defeated Mount Saint Vincent with a score of 3-0, getting their fourth straight win. Maeve O’Sullivan, assisted by Haley Murphy, scored an impressive hat-trick.They took the majority of shots throughout the game. With this win, the women’s team are 3-0 in the Skyline Conference.